I am not a writer; I am a surgeon. My specialty is orthopedic surgery and I have been practicing for over 23 years. My book was conceived and written out of my growing sense of discomfort when watching friends, family members and acquaintances experience long, sometimes painful, surgical procedures without a real understanding of what they were about to go through—or what outcome they could reasonably expect in the aftermath of surgery. 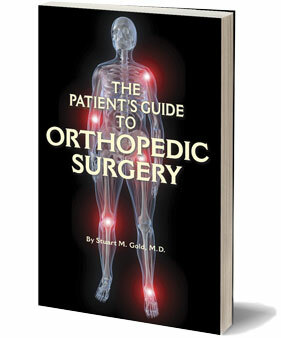 Orthopedics is a field that has evolved tremendously over the past three decades. We—the professionals in the field—have developed techniques to handle a vast array of problems and injuries that affect people of different ages from every walk of life and in varying stages of distress. In many instances, orthopedic surgeons can actually improve (or restore) their patients’ lifestyle and activity levels, significantly boosting those patients’ degree of well- being. And yet…despite improvements and innovations in orthopedic medicine, many people remain unhappy with their outcomes and, worse, are still in pain. But it doesn’t have to be that way. By making responsible and informed choices about your medical care, you can significantly and positively influence your entire experience. That’s where this book comes in. I have written this book to help you maneuver through the hazy medical maze of orthopedic diagnosis, treatment and rehabilitation. When you’ve finished reading these pages, you will have both a good working knowledge of how to get high-quality care and specific insight into your particular orthopedic condition. You will, that is, be a savvy, well-prepared patient—and that’s going to go a long way toward helping you get good results. Let this book and its associated worksheets be your personal patient advocate, extra set of ears, translator and guide to taking charge of you own medical care. There are several reasons why many people have an unsatisfying or even bad experience with orthopedic surgery. The average patient is intimidated or at least flummoxed by long, Latin medical terms. Some patients are over-awed by doctors. Some are simply afraid of or squeamish about any kind of medical procedure. What’s more, many patients either don’t know what to ask their doctors—or are afraid to hear the answers to questions that, if posed, would actually help them to more accurately gauge their medical condition, possible treatments and future results. This manual is designed to answer those questions—or lead you to getting the answers—while raising your level of understanding, confidence and security. The last section of this book is devoted to briefly familiarizing you with general health care practices and health insurance issues. Understanding how these (to my mind) troubled systems work will help you better manage your care and certainly give you some food for thought. As I said earlier, I’m not a writer—I don’t even like to write. So why did I sit down and write this book? This book needed to be written! This entry was posted on Monday, September 27th, 2010 at 7:04 pm	and is filed under About Dr. Stuart Gold. You can follow any responses to this entry through the RSS 2.0 feed. You can leave a response, or trackback from your own site. Print This Post | Email This Post . This looks wonderful. Very professional and full of information. Congratulations…..its about time this book was written. I am very proud of you as usual. Good luck with the book . I hope it reaches many, many people thinking about going through surgery. Too bad thay all couldn’t have you for their doctor.